The Pet Squeak Arf Frame Dog House with dark frame makes an attractive addition to any yard. Stained white cedar makes a sturdy yet adorable little dog house that any pooch would love to call home. Three solid sides means privacy and less exposure to the elements. The elevated floor adds extra warmth to the wooden floor. This dog house is available in four sizes to accommodate most dog breeds. 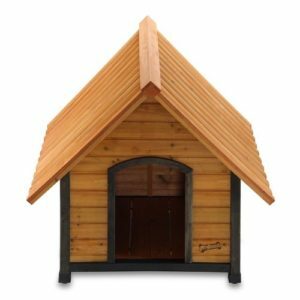 The Pet Squeak Arf Frame is an A-frame style dog house that has three solid walls with an opening in the front. Its wooden peaked roof helps to keep out the rain. The inside of the roof has been sheet-lined to prevent any leaks. The roof overhangs the dog house to minimize the amount of rain entering inside. The wooden floor is raised on caster-like feet for added insulation. Made from stained white cedar, this soft wood enhances its natural beauty. Cedar is known to naturally repel insects and also resists mold growth. This adds to the home’s durability. The Pet Squeak Arf Frame Dog House comes in four different sizes: extra-small, small, medium, and large. The dimensions for each plus the maximum weight of the dog are listed below. The Arf Frame dog house has a single doorway cut in the center of the doghouse. No door comes with the building. You might want to consider placing a heavy mat in front of the doorway to prevent blowing rain and snow from going inside. Keep in mind, the size you need depends on the body size of your dog. For example, Italian greyhounds may weigh less than a pit bull, but have longer bodies. A dog house should be big enough for the dog to stand and turn around comfortably. Dog sizes vary, according to breeds. This is just a guideline for the basic breeds and does not include all of them. When choosing a dog house, it is always best to go by both body weight and size. This dog house offers no insulation. The three solid sides do offer some protection from the elements. The wooden floor can also be raised with the caster legs to provide more warmth. If needed, a heating pad or warm dog bed can be added. The Pet Squeak Arf Frame Dog House only has ventilation through the cut-out doorway. Placing the dog house in a shaded area can help to keep it cool during hot summer months. This dog shelter does not come pre-assembled. Some assembly is required. Assembly includes attaching panels to floor, attaching legs, and the roof. The panels come un-sanded, so clothes may catch. You should also be careful of splinters. A screwdriver is needed. Additional washers and nuts may also be necessary. It is important to remember, cedar is a soft wood. The wood may split during assembly. Taking your time, and drilling pilot holes can help avoid that issue. Check with the refund and warranty policies before making a purchase. Wood stains tend to have strong smells after unpacking. You may want to air the dog house out first before coaxing your pet inside. Accessories complete a dog house. The Pet Squeak Arf Frame, being a non-insulated doghouse, would benefit greatly from a self-warming dog pad to keep your pet toasty warm during the cooler months. This pad uses the dog’s own body heat and reflects it back. This crate pad comes in various sizes and colors. The corners are split to ensure a perfect fit for any size dog house. The best feature about this pad is that it can provide basic heating without costly electricity and without wires that can be chewed or tripped over. It has a microfleece top and a non-slip bottom for greater comfort. If your puppy or dog is a chewer and you are worried about durability, loose bedding can work equally well for providing comfort and warmth. As a safety reminder, dogs should always be placed inside during freezing temperatures and stormy conditions. Customer reviews are important. It helps to do your research in order to make an informed decision before you purchase. A quick scan of available customer reviews allows us to learn of the benefits of and issues with this type of doghouse. Several reviewers commented about the need to air out the doghouse after assembly. This need seems to be the result of strong wood stain odors that dissipate once the unit has been assembled and in use. It is also recommend that you use a well-ventilated area during assembly. This will prevent inhaling too much of the fumes. 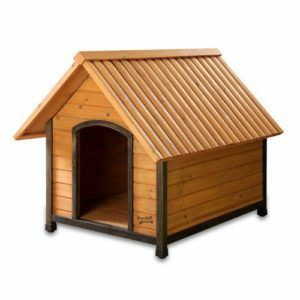 The Pet Squeak Arf Frame Dog House is made from a soft wood. This presented some problems as well in assembly. Comments were made about how easily the wood will split when screwing the walls and roof together. Sanding and extra screws may be necessary to complete assembly. Another issue faced during assembly was the need for washers and nuts to lock the bolts tightly. Despite these possible issues, the overall reviews sounded positive. Dogs seem to enjoy their new private area for napping or relaxing. To make the doghouse last longer, customers put their Pet Squeak Dog House in a sheltered area. This also limits the dog’s exposure to the elements. Placing it in a carport, garage, or basement will help during extremely bad weather and also preserve the longevity of these doghouses. Everyone wants to get what they pay for in a product. Some, like me, hesitate to make a purchase if the product does not seem worth the cost. Many doghouses cause you to spend hundreds of dollars only to have your dogs rip up the flimsy materials or for a storm to blow them to shreds. The Pet Squeak Arf Frame Dog House prices vary a lot according to their size. The smaller sizes can be considered a bargain, especially if you can get free shipping. But even the largest size is fairly priced for a wooden, bare essentials dog shelter designed for normal, everyday use. You are not getting insulation or free doors with this dog house, so this is not a house for harsh climates. But if you are in a moderate climate, it provides your pet with a quiet place to nap or to get out of occasional bad weather. Its attractively stained wood material really looks great and fits into any yard. If the adorable little dog house look appeals to you, this house will save you a lot of time trying to design and build your own wooden dog house from scratch. Extra purchases may be necessary to provide a cozier environment for your dog. Since the doghouse has no insulation, customers might want to add loose bedding or a warming pad to the floor. However, these products are inexpensive and optional. Okay, let’s do a quick review of the facts. The Pet Squeak Arf Frame Dog House comes exactly as advertised. It provides an affordable option for an attractive, durable and comfortable shelter for your dog to use. 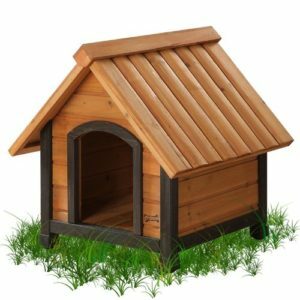 As a tight and cozy place for your dog, this natural wood structure creates an attractive non-toxic shelter that compliments any yard and keeps your dog safe and happily hidden from rain and other dogs. There are some minor issues with odors from the wood-staining process and assembly. These issues can be easily resolved without any impact to the structure. The strong wood odors will fade after about a week of airing out. This doghouse provides only minimal shelter from the elements. As with any doghouse, in conditions of extreme weather, dogs should be placed inside for their own safety. Overall, the Pet Squeak Arf Frame Dog House is a wonderful shelter for your dog to take a rest and escape the rain and perfect for normal use. The affordable price is an added bonus. Customers love this product and consistently rate it highly and so do we. This product comes in 4 different sizes and there is quite a bit of variance in their prices. You can see the prices of each of them at Amazon.